A Munich-bound Lufthansa jet was speeding down a JFK runway, ready for takeoff, when it had to stop suddenly in order to avoid a collision with an EgyptAir plane that had made a wrong turn. The incident happened around 6:50 p.m. Monday at New York's JFK airport, the New York Post reports. "Cancel take off! Cancel take off plans!" an air traffic controller yelled at the Lufthansa jet, carrying 286 passengers plus crew after he saw the EgyptAir flight sitting on the runway less than a mile away. 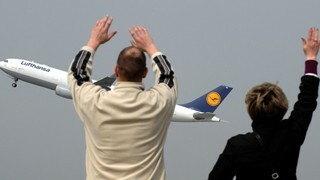 The pilot acknowledged the controller and radioed back, "Lufthansa 411 heavy is rejecting takeoff." At that point, the Lufthansa plane had to push the brakes so hard that the pilots worried they would become overheated. An unidentified pilot who witnessed the near-miss radioed, "Those two were coming together." A pilot aboard a Virgin American flight arriving from Los Angeles said, "That was quite a show." After the Lufthansa jet vacated the runway, Port Authority crews checked the plane's breaks, which were apparently unharmed. The flight finally departed for Munich about an hour and 40 minutes later, and arrived safely in Munich on Tuesday morning. The EgyptAir flight left for Cairo without further incident 90 minutes later. FAA spokeswoman Holly Baker told the New York Post that it might take a few days to figure out how close the planes were to actually colliding. In February, a near-miss between an American Airlines plane from JFK airport and Air Force cargo jets landing in New Jersey forced an NTSB investigation. A plane carrying First Lady Michelle Obama reported near-miss at Andrews Air Force base in April.